Please welcome Anastasia from Here There Be Books as she gives us a little more information about the LA Times Festival of Books! The LA Times Festival of Books is a big celebration of books and authors and the people who love books and authors! It happens every year on an April weekend; this year's festival was my third time going. Labor Day (one of the freebie books I got this year!). The best part of this year's festival for me was definitely meeting up with fellow bloggers. Worst part: listening to an author read his poetry in the style of William Shatner. and runs about every 20 minutes or so. 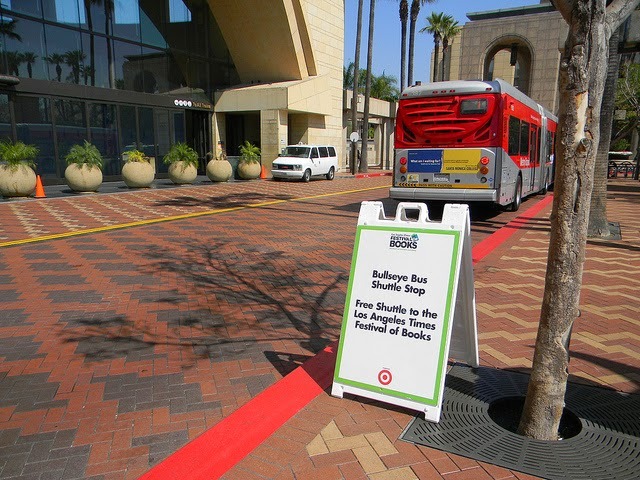 Here is some advice on how to rock #bookfest, which I have curated from years of wandering around not knowing what to do. Talk to the people in the booths! They're trying to sell you something for sure, but they can also be really nice. Do NOT sign up for the "win a getaway" contests. They just want your information for nefarious purposes. Bring water, an umbrella/parasol, sunglasses, sunscreen, and anything else you'd need to feel comfortable on a sunny day. This year's festival had weird weather-- cold in the morning, scorching in the afternoon. Since most of it is outside, I was alternatively freezing and burning! Yay, fun! Keep an eye out for the freebies. You can get some nice things if you're not afraid to stand in line for a little bit. 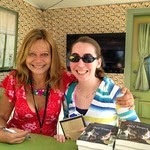 This year I got two signed books, a coffee mug, and drink samples. Yummy! Meet people in shaded places. Some fellow book bloggers and I met up during the festival (exciting!) and I was super glad that we managed to get under some trees. Other good places to meet: the steps of Bovard Auditorium, the secluded area between the food court and another building, and that one place I found but am not telling about because it's my secret place so there. Speaking of meeting people: the Tommy Trojan statue is a central, easy-to-spot monument that works great for both finding your friends AND figuring out the festival map. Tahereh Mafi, Michelle Gagnon and mod Aaron Hartzler. 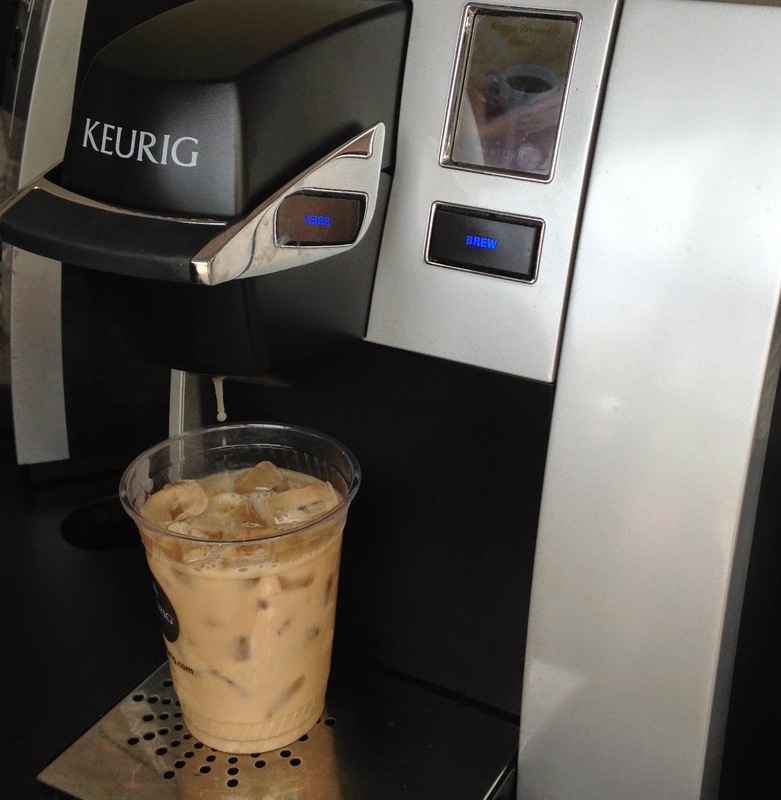 Ditch the panels you're not into and be prepared to stand in line for AGES for the ones you really want. Every year there's at least three Big Time Authors doing panels/readings/interviews, outside of the many celebrity-turned-authors. 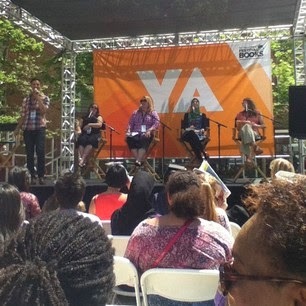 For instance, this year John Green and Rainbow Rowell were both there doing panels and signing stuff, and the lines were INSANE. If you want to be guaranteed a seat, be sure to get a ticket online before the festival starts. And after the panel, prepare to stand in MORE lines-- this time for the autographing session! The signing line for John Green was wrapped around an entire park twice. If you really want that signature, bring comfy shoes and a good attitude. full-sized samples of their choice of flavor. Yummy! Eat at the food trucks. They're expensive, but DELICIOUS! I had a smoked apple pork crepe with apple chutney and some sort of salad. omg, so good! Protip: get your food early, as in before noon. After noon it is PACKED, but before is surprisingly empty of people in lines. And most of all: have fun! If you aren't having fun, get a smoothie and try again. who blogs at Sophisticated Dorkiness. The name of my blog, Sophisticated Dorkiness, comes from a conversation I had with a friend in college. This friend had really good taste in music compared to my, comparably, dorky favorites. He told me that it's ok to have dorky tastes in some areas as long as you can be sophisticated in others. I like to think of "sophisticated dorkiness" as loving both high-brow and low-brow things and not being ashamed of either. I've been blogging for six years, since May 2008. Even though I love to read a variety of genres, my blog has become known for reviews and writing about nonfiction. I love having that niche because it helps me focus on what books to write about and on what books to accept for review. I recently started a feature called the Nonfiction Recommendation Engine where I offer personalized recommendations to readers. I think that feature has been really popular. I write primarily about nonfiction, but I also love to do reviews of graphic novels, audio books, and literary fiction. I've always been a fast reader, so when I was a kid I used to check out huge stacks of books from the library. Eventually, I started picking out books based on how fat they were. That's how I ended up reading Little Women when I was very young and all of the Michael Crichton books when I was in middle school. I've read Frankenstein four or five times for different classes in high school and college. Depends? I use to write in books in college all the time, but I do it less now... I'm not sure why. I love seeing my marginalia in old books, so maybe I should start again! If it's nice, I love to be outside with a book. Otherwise, I love curling up on my couch with a mug of tea and my cat, Hannah. I tend to take notes in a Google Doc that I access with my cell phone, but if that's not available scribble on the Post-It note I'm using for a bookmark. very full, but very specifically organized. The book that made me finally understand how amazing, deep and complicated that literature could be was Heart of Darkness, which I read for the first time when I was a junior in high school. I have a soft spot for Robinson Crusoe by Daniel DeFoe. It's not very good and really weird, but I spent a lot of time picking it apart for my senior paper in college and so it's weirdness has endeared it to me. I'm coming around to Camp DNF, but it's been a slow transition. I don't have a specific book, but two authors who scare me a bit are Haruki Murakami and Toni Morrison. I think I'm worried I won't be smart enough to "get" their writing. I try to do some crafting -- cross stitch and crocheting -- and cooking when I have time. I also like to watch television. I hated the adaptation of Harry Potter and the Order of the Phoenix. I thought it was really awful. Your responses showed you fitting into two different groups - the exacting reader and the eclectic reader. The expression 'so many books, so little time!' sums up your life. You love books but you rarely have as much time to read as you'd like - so you're very particular about the books you choose. Thank you for joining us today, Kim! Why: Jenny of Reading the End hosted a Diana Wynne Jones Week in August 2010 which was a big success. Sadly, Diana passed away the next year in March of 2011. So, when the first anniversary of her death came around, Kristen decided to resurrect the dedicated week, make it a month instead, and spend all of March celebrating Diana’s life and work rather than solely mourning her passing. The events and features vary each year to keep it fun and have included daily prompts, guest posts, read-alongs, watch-alongs and giveaways. The 4th Annual DWJ March will begin on … March 1, 2015! All fans (and even those new to DWJ) are welcome to join and participate as much or as little as they can. Details will go up on the blog and tumblr in February. who blogs at Rach the Redhead. It's pretty simple - just my name and my hair color! I mostly write about literary fiction, just because it's my favorite genre. I love the variety; there's a little bit of everything! I probably wasn't reading, just reciting the words I'd memorized from one of my picture books. Either way, my parents were pretty impressed! It was a book about bubblegum, I think. My entire Harry Potter series is falling apart, I've reread it so much. Sometimes; I've gotten away from it since I finished my English Degree, but occasionally I just have to. A big, cushy chair next to a window (preferably when it's raining outside). I technically can read without my reading glasses, but it's painful after a while. What is the Estella Society? The Estella Society was conceived to be “A Reading Playground Built by Book Bloggers for Book Bloggers.” It's our mission to just have fun! We host readalongs, readathons (including the bi-annual Dewey’s 24 Hour Readathon), the photo meme EstellaGram on Instagram, and more. 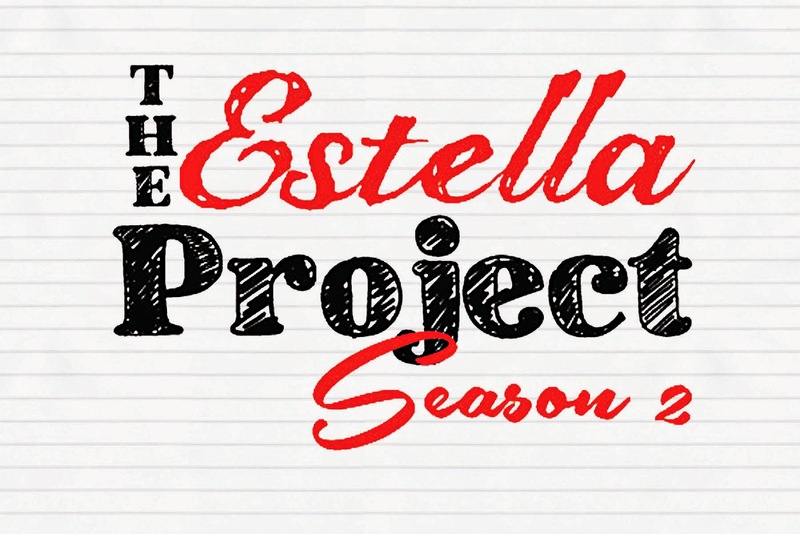 Our newest project will be Season 2 of The Estella Project, launching soon! Last summer, we hosted The Estella Project, asking followers to submit that one book--THE ONE BOOK--that they would put into everyone’s hands if given the chance. Then we challenged them to pick three from the list to read and report back on. So many great books came from it; that we decided to do it again! Who is the Estella Society team? The Estella Society was created by Andi of Estella’s Revenge, the one who is good at putting the words together, and Heather of CapriciousReader, the guru of the technical stuffs. We host events, and partner with various community-building entities across the book blogosphere. We’d love to have you in our sandbox, so send your schemes to estellasociety AT gmail DOT com! Where do I find The Estella Society? Want to co-host a readalong with us? Sponsor a readathon? Hit us up on Facebook, Twitter, or our email at estellasociety AT gmail DOT com. We’d LOVE to have you! 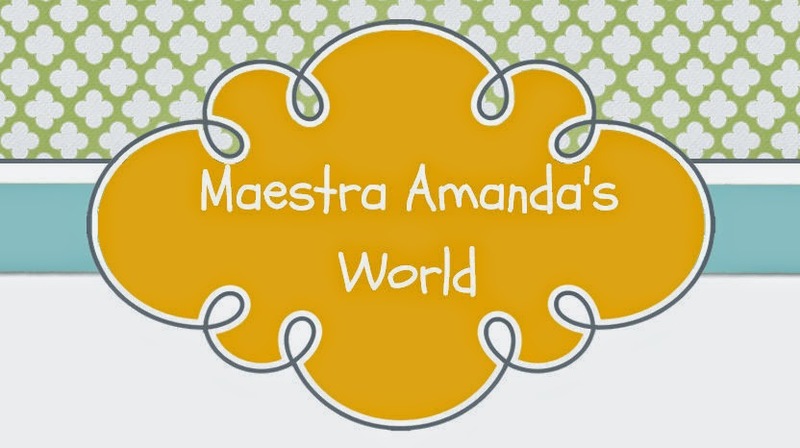 who blogs at Maestra Amanda's World. My first teaching job was teaching bilingual pre-k outside of Chicago. 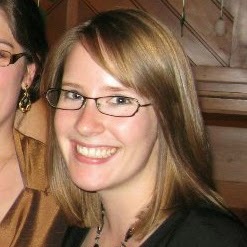 All my students called me "Maestra Amanda" (in Spanish, "maestra" means teacher). I really liked it and wanted to keep it going, especially since I wanted to blog about books that I could use in my classroom / books for younger children. Funny story though---my friend thought that I had named it after the "Maesters" in the Game of Thrones series! I had no idea what he was talking about since I hadn't read the books yet (I have now, so no worries). I *think* it will be 4 years in January. I started out blogging about just books that I've read that I can see being used in the classroom. But, over the years, I've found myself wanting to talk about more---classroom ideas, technology, the dogs, my life, that I felt I needed to just combine it all into one blog. 1. I am an elementary school teacher, so I want to keep current and make sure I'm making great suggestions to my students. Wanting to be like my dad and taking a newspaper into the bathroom with me! Either my bed or my couch. I am coming around to reading on my ipad (kindle app), but I just love having a hard copy. Professionally, THE BOOK WHISPERER by Donalyn Miller. Personally, I really don't know. I feel like every book I read changes just a little part of me---whether it be teaching me something, giving me a different perspective about something, or taking me to a whole new place. Anything Jane Austin. I'm not a "classics" fan. I think she's long winded and boring. DNF. Ain't nobody got time for that. But also, Redwall and possibly Westeros (but I'd totally need sword fighting lessons first). I watch a LOT of tv! I also like to bake, take photographs, travel, and do crafts, like knitting (scarves, fingerless mittens & can coozies only) and making cards (Stampin' Up). I HATED the ANGELS & DEMONS and THE DA VINCI CODE book to movie adaptations. But I think that the one that is the worst is the Percy Jackson movies. Hollywood just changed too much. PJ was almost a totally different story by the time the movie was over. THE TALE OF DESPEREAUX was like that, too. Thank you for joining us today, Amanda! Hey everyone! I’m here to tell you all you need to know about a blogging event called Bloggiesta. It’s a four times a year blogging marathon where we get together online with other bloggers to make and work on our list of blogging goals. 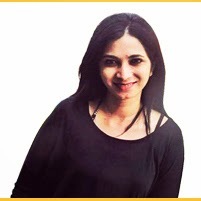 The best thing about the event (besides networking with other bloggers of course) is the mini challenges that participating bloggers post on their blogs which teach the rest of us how to do some fun blogging tasks. But first, you may be interested in a little back history. Bloggiesta started around 2009 I think, when Natasha from Maw Books Blog decided she had a ton of blogging tasks that needed doing. She thought, wouldn’t it be fun to see if others wanted to accomplish some blogging business too and everyone could get together one weekend, online, and work on their blogs with each other. She named it Bloggiesta and created a mascot (Pedro) and a graphic and a motto and all sorts of things to make the event fun. She ran it twice a year for a couple of years but then she had a baby...and stopped blogging... and Bloggiesta languished for a year or more. At one point she asked for volunteers to get it started again, so that’s when Danielle and I (Suey from It’s All About Books) took it over and got it going again in March of 2012. That was such a fun and well received come back! We’ve made a few changes since then including the additions of mini events, and Twitter chats. Danielle’s life then got crazy and so now I manage the event with the technical help of Jessica from The Bluestocking Society. We have “main” Bloggiesta events in March and September (usually the third or last weekend of the month) and “mini” events in January and July (also third or last weekend of the month.) The main events now last four days, Thursday through Saturday and the mini events are just the two day weekend. Everyday of the events, we host a Twitter chat which is always a lot of fun. This past event we had themes for each chat, which worked out really well. During the main events, we have 15 to 20 mini challenges which can help bloggers with blog basics, technical things, design help, organizational tips, or simply inspire you with lots of blogging ideas. We also have challenges that help people get out and meet other bloggers. And that’s it! We keep the event simple and really try to focus on spending time working on our blogs and networking with others doing the same thing. We welcome any blogger who wants to participate! At the start of each event, we’ll have a sign up linky, which simply asks participants to link up to their goal “to do” lists. We hope to see you there! who blogs at Punk's House of Books. I've only been blogging for about a year and a half, so I guess I'm still a newbie. I love fantasy and supernatural. My reasoning is simple, I just love them. It takes so much imagination to write those kinds of books. There are whole new worlds and languages created, it's exactly what I look for in a good book. A place where I can lose myself. I don't exactly have one clear memory, but I know I've always been a reader. My family says ever since I learned how to read, I always had my nose in a book. I do remember being taken to the library once a week as a kid and often hitting the checkout limit. There are two books that I've read over and over. White Oleander by Janet Fitch and The Mists of Avalon by Marion Zimmer Bradley. I haven't had the chance to read them again since I started the blog. I really need to get on that! Crammed full and in need of some serious rearranging. Dangerously long and continuously growing. Okay, I know how this sounds and don't laugh (okay you can laugh a little) but Twilight. NOT because it was so profound that it moved me or whatever (hahaha!) but because it introduced me to fandom, which led to meeting new friends and writing and book blogging. There are probably tons, but I think I'll say Easy by Tammara Webber. I'm not fond of that book. I don't hate it but I don't think it lives up to the hype. I try really really hard to finish books, even if I don't like them. I think I've only DNF'd maybe five books, ever. All literary classics intimidate me, because I feel like I'm supposed to like them to be a "reader." The Potterhead in me says the HP movies. But honestly I think it's a tie between the Lord of the Rings movies and The Hunger Games movies. Those adaptations are pretty spot on and the changes are ones I can understand. Except Peeta's leg. I don't understand that one but I *try* not to let it bother me. Thank you for joining us today, Chrissy! 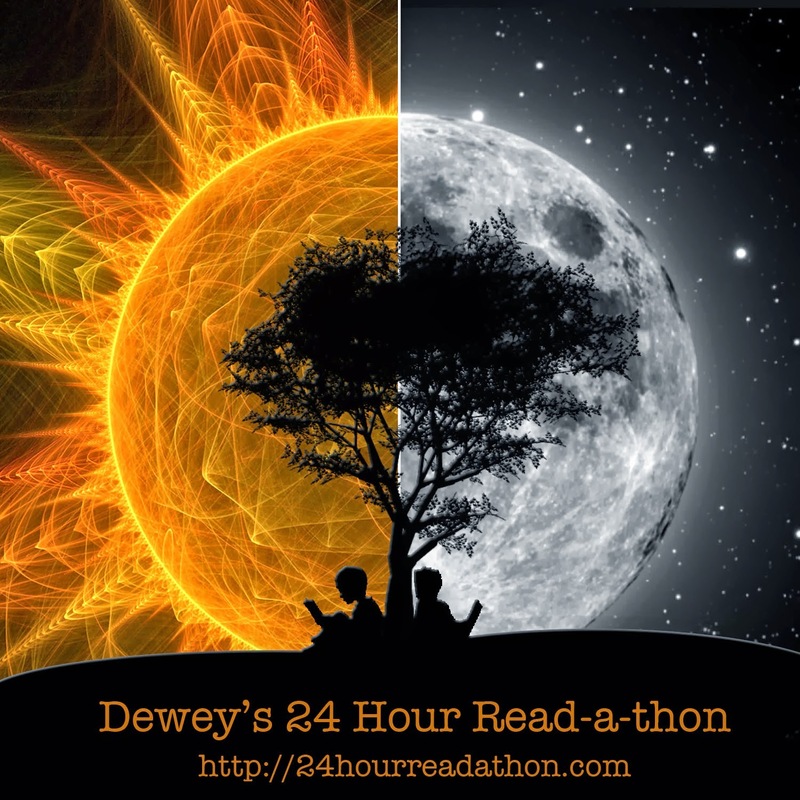 What is Dewey's 24 Hour Read-a-Thon? We're also really proud that Dewey's was the original readathon! It was founded in 2007 by our dear, fearless leader who passed away in 2008. When is Dewey's 24 Hour Read-a-Thon? It's always in April and October. The dates vary slightly depending on what's shaking in the world, but we post the dates on 24HourReadathon.com so it's easy to find! We'll also begin publicizing on Facebook, Twitter, and other channels about a month before each event. Who is the Dewey's 24 Hour Read-a-Thon team? We have a big, awesome team of helpers! At the helm are Andi from Estella's Revenge and Heather from CapriciousReader. We also have volunteers to who post "warm up" blog posts with advice and recommendations in the week leading up to the event. Then there are somewhere between five and 10 hourly hosts. 21 hourly mini-challenge hosts, a bunch of prize wranglers, and prize donors! Whew! It's a bit overwhelming. Where do I find Dewey's 24 Hour Read-a-Thon? We're also working on a Goodreads group for the October event! There's no better way to feel the vastness of the bookish community online! It's amazing to see hundreds of people (800+ in April 2014) sign up and to know that you're all READING together, celebrating books on one glorious day! In short, it's just plain fun. If you've never participated before, we recommend jumping into the fray at least once to get your feet wet and see what it's all about. We guarantee you'll get some great reading done and you might even meet a ton of new people on Twitter or out and about by visiting some new-to-you blogs. Honestly it doesn't mean anything. I just started the blog for fun and I was sure I was going to delete it after a couple of days. That was in 2007 and here I am. A few bloggers might know me from violetcrush.wordpress.com. I recently decided to self-host but I kept violetcrush since it was associated with me for a long time. Since 2007. Initially I posted about anything and everything but eventually bookish things started to creep in as reading was and is a huge part of my life. Today, I still occasionally blog about my personal life but it's mostly about books. hmmm...I don't know. I guess people who read my blog would be able to answer that better. But I do read a lot of different genre's from memoirs to Young Adult. I read a lot of different genres but if I have to narrow it down I would say romance, YA and memoirs. The previous two I read whenever I need a quick or a light read. The later I read because I love to experience what kind of lives other people lead, even if it's through pages. Interestingly I never read when I was a child. My first book was a 10 page children's story which my father bought for us. That was the first and last book my parents ever bought. But somehow I turned into a bookworm. I would say My Girl by Patricia Hermes which also has a movie made on it which I haven't seen till date. I borrowed this book from my friend and I read it at least 5 times before returning it to him. I remember I cried a lot too...every single time. Definitely yes. I feel books are meant to be read, bookmarked, written on and dog-eared. I call it getting every ounce of knowledge, pleasure, information or whatever else you want from it. I would say in the bus while commuting to work. Since I work full time I don't get a lot of time to read, so that 45 min in the bus is my reading time. None. A bookmark maybe but then I just dog-ear it if I can't find one. the best decor in my house. Since we rent our house, I can't have too many bookshelves. I make do with whatever I have but even a small bookshelf overflowing with books looks beautiful. hmmm...I always have no answer to this question. I guess all the books I've read over the course of time have changed me in some way or the other. Although I can't really give you one name. The Blue Notebook. I hated that book, I gave it one star. Everyone seems to have loved it. Sometimes you don't really have a choice. If I feel guilty I just have to look at my TBR pile once. There are too many good books out there to waste time on one that isn't for you. I would go to Green Gables. I love dancing. I do kathak which is a classical Indian dance. I love watching movies, documentaries. I love listening to music. I love cycling, going on a trek. And traveling. Thank you for joining us today, Violet! May is a Month of Events!